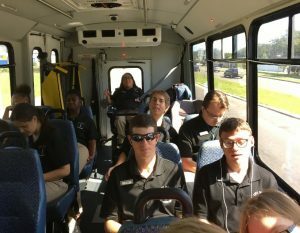 Spring was an exciting time for all involved with the St. Johns County School District Deaf or Hard of Hearing (DHH) program. With a generous donation from the St. Augustine Lion’s Club, fun and enriching activities were held for all DHH students and their families. The 3rd Annual “Deafinition” competition was a great success. The competition is a family event for middle and high school students to show off their vocabulary knowledge. Students prepare all year for this vocabulary bee and, in doing so, enhance their vocabulary and language skills across curriculum areas. 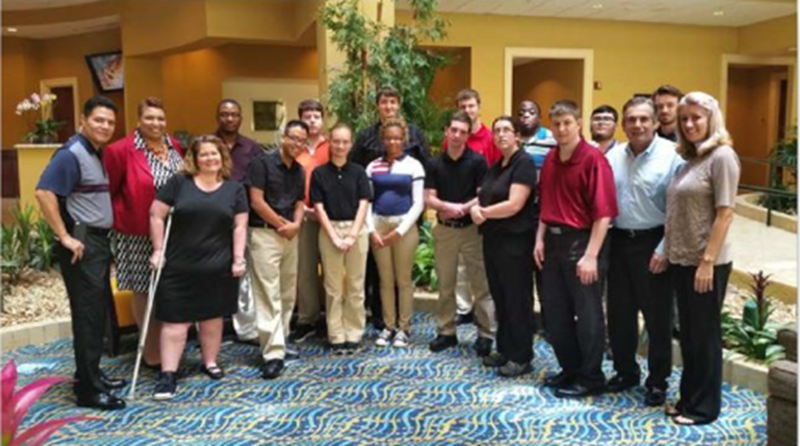 This year, 24 DHH students participated in the competition. Gift cards were awarded to the first and second place winners. We are proud of all who participated. On April 22, the annual DHH picnic was held for families and students across the county. This year’s theme was “Fun Run” which included an obstacle course, games, water activities and a song signing competition for St. Johns County School District American Sign Language programs. This is not just celebration of students, but a positive way for families who have children with hearing loss to connect and support each other. GOAL: To provide interventions and strategies to parents of students with disabilities that will assist students in developing resiliency skills and attitudes, which will enable them to persist in the face of adversity. The purpose of the committee is to provide input to district staff regarding our ongoing effort to continuously improve services for students with disabilities. Parents, Educators, Administrators, and Business Representatives are invited and encouraged to attend. Parents, educators, administrators and business representatives are all invited to attend. This event is provided by the ESE Parent Advisory Committee of St. Johns County School District. The Parent Advisory Committee is composed of parents, educators, administrators, business representatives, and other interested community members concerned with the education of students with disabilities. The purpose of the committee is to provide information to parents and input to district staff regarding our ongoing effort to continuously improve services for students with disabilities. The Gifted Parent Advisory Council (GPAC) meets four times per year to inform the school district about ways in which we can improve our efforts in serving our gifted students. Information about giftedness and ways to help our gifted students are presented at these gatherings. Parents of K-12 gifted students from throughout the district are encouraged to come to the meetings. GOAL: In an effort to provide parents of ESE students with trainings to increase their ability to actively participate and collaborate with a comprehensive school team, a facilitated IEP training for parents will be provided. The Parent Advisory Committee (PAC) is composed of parents, educators, administrators, business representatives, and other interested community members concerned with the education of students with disabilities. The purpose of the committee is to provide information to parents and input to district staff regarding our ongoing effort to continuously improve services for students with disabilities. Disability Awareness Weeks (the first two weeks of October) were created to highlight the efforts, important contributions and achievements of individuals with disabilities. People with disabilities consist of the nation’s largest minority group, as well as the only group that any of us can become a member of at any time. more than 14,000 students with disabilities enrolled in the State University System. It is important to continue encouraging individuals with disabilities to realize their abilities in their education, employment and communities, and to reaffirm our commitment to the full inclusion of and equal opportunity for all individuals with disabilities. 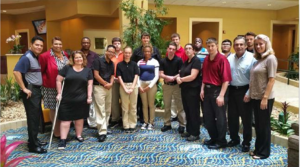 The Renaissance World Golf Village (WGV) is hosting an internship with a group of district students called Project Search. The goal of the internship is to teach competitive, marketable and transferable skills for people with disabilities. The acquisition of these skills should lead to competitive employment at WGV or with another community employer. The intern will also learn employable skills and the workplace culture to assist in the transition from an intern to a successful employee. The Parent Advisory Committee (PAC) is composed of parents, educators, administrators, business representatives, and other interested community members concerned with the education of students with disabilities. The purpose of the committee is to provide information to parents and input to district staff regarding ongoing efforts to continuously improve services for students with disabilities.